Pound Wood is just one of a series of woodlands in the Daws Heath area. They form part of the Belfairs, Hadleigh and Daws Heath Living Landscape (LL47)). Here, Cliff Moore explains the concept and how it applies to the area surrounding Pound Wood. The Daws Heath Living Landscape is 470 Hectares of mainly open land which is large enough to support important populations of indigenous plants and animals in the long term, notwithstanding the fact that it is surrounded by the urban settlements of Rayleigh, Leigh-on-Sea, Hadleigh and Thundersley. Notable species include the Heath Fritillary butterfly, the Dormouse and Wild Service tree. As well as four Local Wildlife Sites and an SSSI there are five nature reserves here: Little Haven, Tile Wood and Pound Wood are managed by the Trust, West Wood by the Castle Point Wildlife Group (an independent charity) and Belfairs by Southend Borough Council. The Trust hopes to sustain and improve these as well as private land where the owners value wildlife, thereby encouraging others who are not yet won over to conservation. Our nature reserves are managed by a large team of dedicated volunteers, supported by two staff (at Little Haven and Belfairs) and three volunteer wardens. The woodlands are coppiced in rotation to improve diversity and benefit ground flora, such as Bluebells, Wood Anemone and Broad-leaved Helleborine. The meadows at Little Haven are managed by hay cutting and grazing to maintain and enhance their value to wildlife, which includes a colony of Marbled White butterflies. The rare Heath Fritillary butterfly was re-introduced into Pound Wood and has now colonised Little Haven and Tile Wood, illustrating the value of managing all three nature reserves as one ecological unit. At Little Haven, the management of these open glades has also led to the development of acidic grassland, within which Heather is now frequent, putting the Heath back into the Daws Heath! Much of the landscape is already open to the public for quiet enjoyment and we will inform more local residents of these amenities, involving them in the management so that they will come to value and protect them. An attractive landscape is now recognised by the medical profession as an important aspect of good health. We celebrate our woodland heritage on ‘Bluebell Day’ held on the last Sunday in April; and other events are planned. As well as involving schools in learning about the environment as part of the National Curriculum, we want to encourage more children to become involved in the Landscape so that they will enjoy and understand the important part that the natural world will play in their future lives. This was facilitated by the opening of the Belfairs Woodland Centre in 2013. Our local woodlands already produce sizeable volumes of woodland products such as charcoal, posts, planters and FSC-approved logs. Local meadows provide naturally-grown grazing for sheep and cattle, and hay for the many local horses. We plan to build on this base making a larger contribution to the local economy. We wish to thank the Heritage Lottery Fund and Veolia Pitsea Marshes Trust for sponsoring our efforts to achieve the aims of this Living Landscape: wildlife conservation, education, community involvement and economic improvement. To the east, across St Michael’s Rd is Tile Wood. This appears on some maps as Tile Wood East. This was purchased by the Essex Wildlife Trust in 2000. Further east lie two woodlands, Wyburns Wood (formerly known as Tile Wood West) and Starvelarks Wood, both lying within the Little Haven Nature Reserve. This reserve is owned by the Little Havens Childrens Hospice Trust, and is managed by the Essex Wildlife Trust. 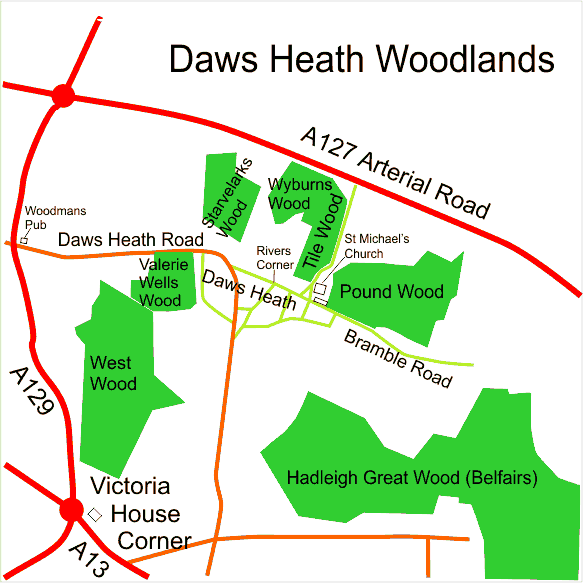 To the south-east, beyond Daws Heath Rd, lies Valerie Wells Wood and the larger West Wood. Valerie Wells Wood (formerly Cottage Plantation) was purchased by the Essex Wildlife Trust in 2013. West Wood is owned by the Castle Point Borough Council and managed by the Castle Point Wildlife Group. To the south lies Hadleigh Great Wood (also known as Belfairs Wood). This wood straddles across both Castle Point and Southend, and is owned by Southend Borough Council. The Little Haven site was purchased by the Little Havens Childrens Hospice Trust in 1996 as a site for their Childrens Hospice. As part of the planning permission, they entered into a planning agreement with the Essex Wildlife Trust who will manage the bulk of the site, other than the building and its immediate environs, under a 40–year lease. The Hospice Trust also provides financial support for the employment of a warden. The site was originally part of the Lower Wyburns Farm and bore that name. Following the purchase of the site, and with the agreement of the new owners, the Trust gave it the name of the Little Haven Reserve. The reserve now comprises some 92 acres of fourteen meadows and two woods. The meadows were originally semi-improved grassland that was improved (for agriculture rather than for wildlife). However, sympathetic management has improved the wildlife of these meadows. An important feature of the site is the series of linked hedgerows separating the meadows. These provide a valuable wildlife resource, not just for the trees comprising the hedgerow, but the rich ground flora at the base of these. Current management is aiming to encourage this richness. This reserve was formerly part of Lower Wyburns Farm and is leased from the Little Haven Children’s Hospice by Essex Wildlife Trust. It was declared a nature reserve in 1996 with the building of the hospice. It comprises 14 meadows, a network of fine old hedgerows and two woods. Starvelarks Wood is mainly sweet chestnut and is probably a 19th century plantation that has been under coppice management. Wyburns Wood contains a complex range of tree and plant species, indicating its ancient origins. It is very damp in places and here it supports a rare type of woodland known as plateau Alder wood, which has a ground flora of male fern and Pendulous Sedge. Most of the meadows are cut for hay and many are aftermath grazed to maintain the grassland habitats. Some hedgerows are coppiced or laid. The reserve is the venue for the Bluebell Five fun run, an annual five-mile run that takes in both woodlands and meadows. In Aug 2008, Runners World stated that ‘The cake stand at the finish is regarded by race veterans as unrivalled’! One of the earliest ancient woods to have been recorded in south-east Essex, being mentioned in anglo-saxon times. The tree species are predominately Sessile Oak, Hornbeam and Sweet Chestnut, with some Wild Service. It is particularly rich in ancient woodland plants, including Wood Sorrel, Bluebell and Wood-rush, and has many Wood Ants. Cottage Plantation is a very old, if not strictly ancient wood (by definition). The canopy is dominated by overgrown Sweet Chestnut (Castanea sativa) coppice (possibly anciently planted and the source for the old site name of “plantation”), with some Oak (Quercus sp.) standards. Common Cow-wheat (Melampyrum pratense), Hairy Wood-rush (Luzula pilosa), Great Wood-rush (Luzula sylvatica) and Wood-spurge (Euphorbia amygdaloides) are present amongst the ground flora, which is generally dominated by Bramble (Rubus fruticosus). Some coppicing is still in evidence. Rag Wood is an area of recent Sessile Oak (Quercus petraea), which is of particular value in linking Cottage Plantation and West Wood in the south into one ecological unit. The reserve now also includes the meadow to the north-west corner of the wood.This has been given the name of Nash’s Meadows, named after a previous owner in the area. Castle Point Borough Council has recently bought West Wood. Currently, the management is done on behalf of the Council by the Castle Point Wildlife Group (not the Castle Point Group of the Essex Wildlife Trust).